SCVHistory.com | St. Francis Dam Disaster | Coroner's Inquest in the News: Witnesses Report Leaks, 1928. Coroner's Inquest in the News: Witnesses Report Leaks. Bursted Dam Seepage First Seen on Feb. 1, Witness Says. Associated Press | As published in the (Helena, Mont.) Independent Record | March 27, 1928. Los Angeles, March 26. — (AP) — Testimony was given at the inquest today into the St. Francis dam disaster, that seepage through the west end foundation had been observed as early as February 1; that on Saturday and Sunday before the dam burst, on Monday night, March 13 [sic; Monday was the 12th], the seepage had "increased greatly," and on Monday it was "100 percent greater than on Sunday," and was "very muddy." 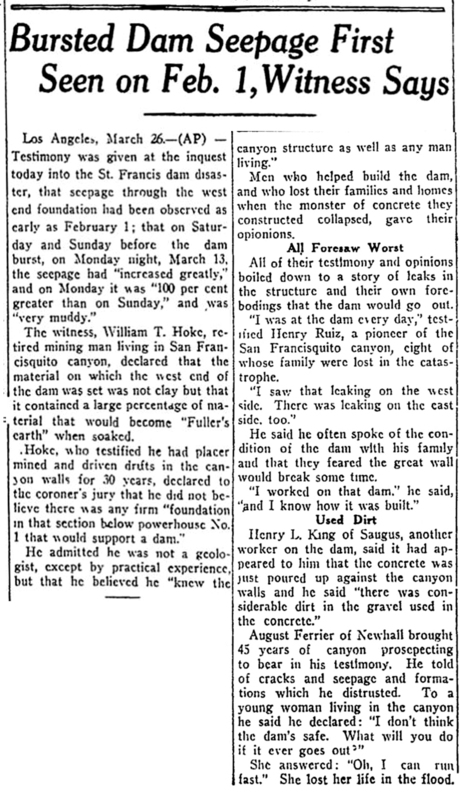 The witness, William T. Hoke, retired mining man living in San Francisquito canyon, declared that the material on which the west end of the dam was set was not clay but that it contained a large percentage of material that would become "Fuller's earth" when soaked. Hoke, who testified he had placer mined and driven drifts in the canyon walls for 30 years, declared to the coroner's jury that he did not believe there was any firm "foundation in that section below powerhouse No. 1 that would support a dam." He admitted he was not a geologist, except by practical experience, but that he believed he "knew the canyon structure as well as any man living." Men who helped build the dam, and who lost their families and homes when the monster of concrete they constructed collapsed, gave their opinions. All of their testimony and opinions boiled down to a story of leaks in the structure and their own forebodings that the dam would go out. "I was at the dam every day," testified Henry Ruiz, a pioneer of the San Francisquito canyon, eight of whose family members were lost in the catastrophe. "I saw that leaking on the west side. There was leaking on the east side, too." He said he often spoke of the condition of the dam with his family and that they feared the great wall would break some time. "I worked on that dam," he said, "and I know how it was built." Henry L. King of Saugus, another worker on the dam, said it had appeared to him that the concrete was just poured up against the canyon walls and he said "there was considerable dirt in the gravel used in the concrete." August Ferrier of Newhall brought 45 years of canyon prospecting to bear in his testimony. He told of cracks and seepage and formations which he distrusted. To a young woman living in the canyon he said he declared: "I don't think the dam's safe. What will you do if it ever goes out?" She answered: "Oh, I can run fast." She lost her life in the flood.